Getting there! I've got 2119 of my 2500 goal. And I'm going to try to finish up my inches this (long) weekend so I can slack off a bit when I go back to work. As soon as I finish the 2500, my reward will be to install Paint Shop Pro 9 and start working through the 500 page user guide. I never know what I'm going to end up with when doing my Scribble Art... but it sure is interesting. Trying something new, these are chalky pastels on small black cube paper. Fun! I especially love my "Fat Flower Rat." The black paper did not scan well, at all. I had to play with the settings a lot in order for the pastels to show up on the computer... so the colours that you see are not exactly the colours that I made. but, eh. 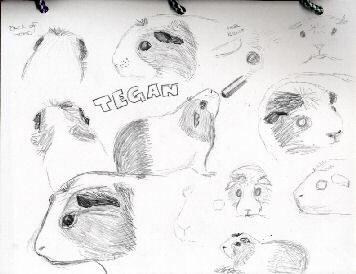 Some pencil sketches of Tegan the guinea pig in my art notebook. This time I took away her tent so she could not hide... but she's still moving around too fast! If only I could catch her in the middle of a nap. And an Anteater digital scribble. All kinds of critters lurking in those scribbles! And today is Buy Nothing Day, to protest consumerism. I'm not buying anything today!